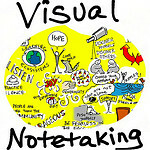 Visual notetaking or sketchnoting is a process of representing ideas non-linguistically. 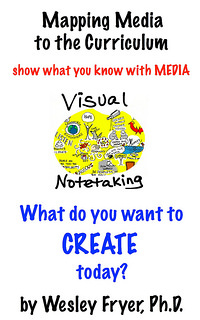 (That’s a fancy of way of saying, “drawing pictures.”) Visual notetaking can include concept mapping, but also more artistic ways of visually capturing and representing ideas. On the simpler side of the visual notetaking continuum, visual notes can be used to create narrated art. 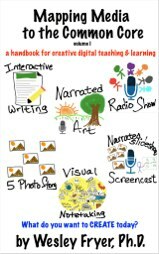 On the complex end of the spectrum, some visual notetaking applications support the creation of narrated sketchnotes (whiteboard animation videos) which include audio narration synchronized to screencasts of drawings. Visual or graphic facilitation can be used at meetings to summarize presentations and guide discussions. Whether simple or complex, visual notes can be used to more deeply process information as well as communicate it to others with images. Resources on this page last updated on 3 April 2018. Rachel Smith’s 18 minute TEDx talk, “Drawing in Class,” also provides an excellent overview about the “what and why” of visual notetaking. Follow Rachel on Twitter @ninmah. Giulia Forsythe‘s 68 minute presentation for the 2012 University of Mary Washington Faculty Academy on “Drawing Conclusions” is also excellent. (SlideShare also available) The CBS Sunday Morning program “The higher purpose of Doodling” (19 Jan 2014) is 7 minutes long and super! More iPad drawing apps on this Appolicious list. Wesley’s current favorite iPad stylus is the Jot Mini. * Image attribution: Visual Notes from Unplug’d 2012 by Giulia Forsythe, used with permission. Remixed image on Flickr by Wesley Fryer. Thanks for sharing both your presentation and resources. You have an excellent overview and some new apps and links that I want to check out. I have been exploring visual notetaking both personally and with my students over the past year. You might be interested in the sermon sketchnotes that my middle schoolers have been making. I also have a tutorial video that I made that has been a good introduction to the process to share with students (links at the bottom). You are one of my favorite people to follow on Twitter because you share my passion for iPad mulitmedia and share so freely! Thanks again!